Texas Instruments filed already October 24, 2003 in Europe a patent application for a stylus based calculator and since the publication of the granted patent EP1424626 in June 2004 there are rumors about a new graphing calculator. The patent itself describes a then novel method of entering data with a stylus into graphing software applications. The sketch of the suggested design of the new calculator reminds us immediately to a failed development project nicknamed PET by the marketing department of Texas Instruments. We discovered in 2007 one of the rare prototypes labeled TI-PLT. 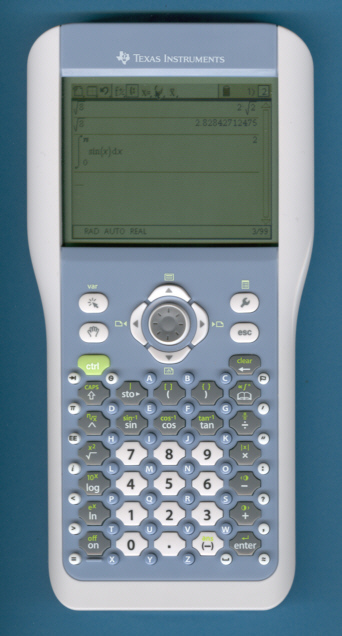 The TI-Nspire CAS+, also known as Phoenix 1, obviously lacks a stylus and seems to trace back to another root than the "PDA-based graphing calculator", a hype started early in this millennium with the Hewlett Packard Xpander. This Windows CE based calculator looked like a PDA with a 240 * 320 pixel gray-scale touch screen, a small numeric keypad and the stylus. Hewlett Packard canceled the project February 2001 with just a few prototypes left to the disappointed market. Dismantling one of the prototypes revealed a design centered around a Hitachi SH3 RISC-Processor, 8MB of RAM and 16MB of ROM. Japanese calculator company Casio was more successful and introduced in 2002 the ClassPad 300 with a 160 * 240 pixel gray-scale touch screen supporting a lot of stylus based operation like drag-and-drop. This design makes use of the Hitachi SH7291 - a SH3 based RISC-Processor, 0.5M Bytes of RAM and 4M Bytes Flash-ROM. The ClassPad 300 Plus introduced in 2005 makes use of a much improved display with higher contrast and better readability under low lighting conditions. Please notice that the evaluation of the TI-Nspire Prototypes led to a 2nd generation design with yet another color scheme and keyboard layout. Interesting to learn that these samples were labeled TI-Nspire CAS+ but still sported the "Phoenix" project name on the printed circuit boards (PCB's). Please notice this press release dated May 12, 2006 announcing the New Zealand introduction of the TI-nspire™ CAS+. The disassembled TI-Nspire CAS+ prototype (Manufactured April 2006) features one SST 39VF400A NOR Flash-ROM, manufactured by Silicon Storage Technology, Inc. with a 256k*16 organization and one ST NAND256W3A NAND Flash-ROM with 32M Bytes size. The program and data memory of the disassembled TI-Nspire CAS+ consists of one Infinion HYB18L256160 SDRAM with 16M*16 size. Display: The TI-Nspire CAS+ uses a high-contrast display with a resolution of 240 * 320 pixels, a huge improvement over the TI-89 Titanium with 100 * 160 pixels or the Voyage 200 with 128 * 240 pixels. The large 16-level grey-scale displays includes a novel split screen capability with up to 4 views. The driver circuit of the LC-Display is compromised of 2 column driver and one row driver manufactured by Novatek, Taiwan. We located a NT7702H row-driver as bare chip mounted on a flexible piece of circuit board attached between the display and a PCB and two unknown column drivers.